Feel free to share your comments with us. A strong brand makes your organization recognizable and helps people understand the unique value you bring to the nonprofit sector and to the communities you serve. Knowing how to evaluate your brand can mean the difference between having a recognizable presence in the field and getting lost in the shuffle of organizations doing work on similar causes. What is working best about your brand? What can be improved? What makes the brand most effective? Is your brand doing the most for your cause? Everyone knows Bongo the clown and his car, “Little Pink.” After 15 years, Little Pink is showing its age. Friends and fans have been making comments, so it seems that it is time to think about a new ride or a refresh for his old buddy. Bongo needs to take a step back and assess if Little Pink’s best days are in the past or whether there are other changes or updates that Little Pink might need to keep going for the next 15 years. Similarly, your cause needs to periodically take a step back and honestly assess where you are, what others know and think of you, and see how it compares to your view of where you want to be in the world. 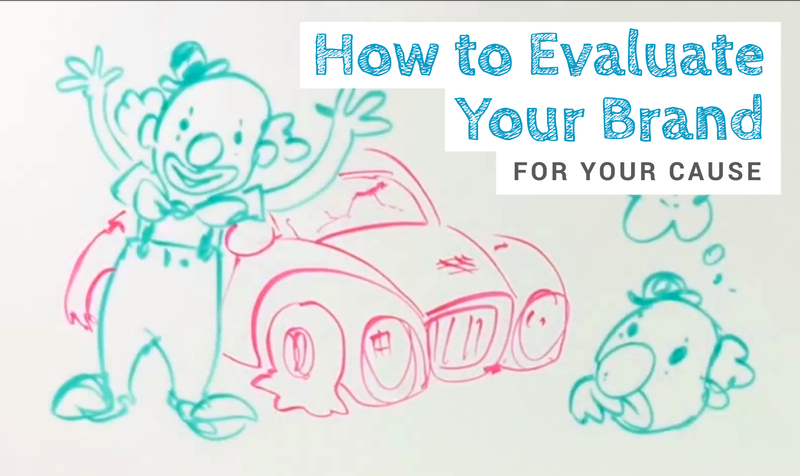 How can you evaluate your brand? The process need not be long, painful or costly. In fact, we suggest three steps to evaluate your brand that will get you feedback from your internal audiences and external stakeholders. Gaining a clear understanding of your brand’s strengths and weaknesses will enable you to strengthen what’s working or shift your efforts to ensure your organization remains relevant and distinct for years to come. Ready to get started? Scroll up to download the free worksheet and go through the process for your cause.